I've already admitted that I bleed orange, so I thought it fitting that I start the 2013 NFL football season with yet another Denver Broncos-related vinyl find. 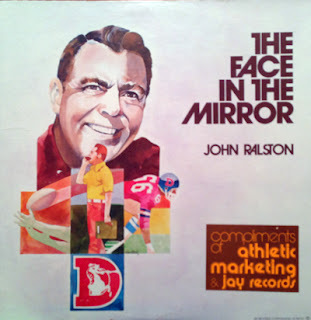 The Face in the Mirror (Jay Records 10072 - 1974) is a spoken word, "how to sell with confidence" LP courtesy of then-Broncos head coach, John Ralston. Coach Ralston apparently knew a thing or two about success, when he took the Orange Crush from a 5–9 record in 1972, to it's first winning season (the following year) 7-5-2, and the follow-up 7–6–1, in 1974. Ralston rode on the coattails of the Broncos turnaround, going on public speaking tours, touting his secrets to winning. His "think positive" talks were a hit with sales conventions, where The Face in the Mirror was apparently recorded (no note of where or when on the disc). Unfortunately it would not be Coach Ralston hoisting the Lombardi trophy. 1976 was a make or break season for the coach, who had taken a beating in the media (and the fans) for the 6–8 record the previous year. While the team went on to finish with a 9–5 record, it was not enough to get them in the playoffs. To add insult in injury, Broncos players issued a protest vote of no confidence in their coach and Ralston resigned at the end of the season. 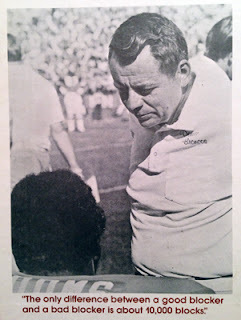 It would be coach Red Miller who, in 1977, took the Broncos to their first playoff appearance, and ultimately first Super Bowl, where they were defeated by the Dallas Cowboys, 27–10 (of course, we all know how it ends in 1997 and 1998). Ralston went on to be the assistant coach of the Philadelphia Eagles, the San Francisco 49ers...and the Toronto Argonauts. He later became head coach of the USFL Oakland Invaders, and the Dutch (Netherlands) Lions.